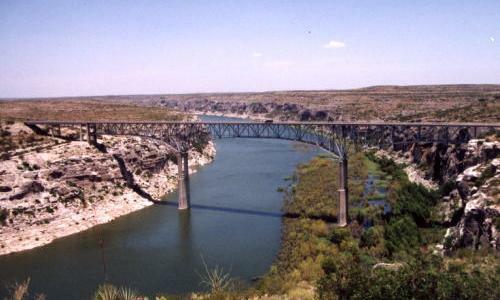 Pecos River Railroad Bridge and Langtry Texas Scenic Overlook. 18 miles east of Langtry is a thoughtful courtesy of the Texas Highway Department. 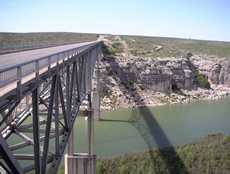 At the east rim of the canyon, there are two spots for viewing the Pecos River. One is south of the highway and might not be apparent to the driver heading west. Both are great for photos, but the South side location is actually a roadside park with picnic tables. This is the best single view of the entire region. Open 24 hours. 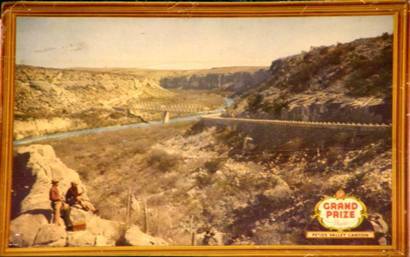 In 1892, about a decade after the Southern Pacific laid its tracks through West Texas, the railroad considerably shortened the route by building a huge bridge across the lower Pecos. That river -- Texas' westernmost if you don't count the Rio Grande -- winds like a rattlesnake across West Texas, emptying into Lake Amistad. 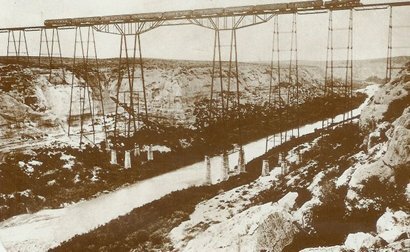 An engineering marvel, the Pecos River Viaduct (as it was formally known) spanned 2,180 feet and towered 321 feet above the river. 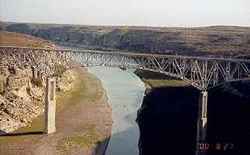 For years, the metal structure ranked as the highest bridge in the United States and the third highest in the world. Postcards of the bridge became a favorite medium for the classic "Having a good time, wish you were here" message. Gutsy local cowboys, confident they had a good horse and perhaps further emboldened by a little whiskey, occasionally rode across the walkway that adjoined the tracks on the bridge. There were no guardrails.